My almost weekly trip to the Shibuya Nagi is always met with a cold beer and a hot bowl of noodles, and also an invitation to their newest shop in Shinjuku. Deep in the heart of Golden Gai, a place which must be seen, is this little ramen shop. Golden Gai will be in your travel books, or easily pointed out by a local host. Hunrdeds of small drinking establishments, most only holding 4 or 5 people at a time line the dark alleys. There's also a ramen shop holding about 5 cozy people. On a tuesday night at 7:30 there were a few people in there, but I was able to squeeze into a seat. The special here is the long flat noodles, which are then cut by hand into thin ones. The standard bowl also comes with a couple uncut noodles thrown in for fun. One thing about Nagi, with it's 3 locations in Tachikawa, Shibuya, and Shinjuku is that each one has a very different taste. At the Golden Gai shop, a lot of fish goes into making the thick soup. Also a good amount of green onions. So expect a strong taste. The owner is a cool guy named Ikuda. Very welcoming, he was overjoyed that I had come from the Shibuya shop and that I was somewhat of a ramen maniac. But, unfortunately, he speaks crazy fast, so I only understood a third of what he said! Exit out the south of Tachikawa station. It's on the street level. Right next to Tachikawa station, in what could only be described as prime real estate gone bad, is a little ramen shop. Literally 2 seconds from the busy station, this run down building looks like it could go any day. It was recommended to me by a student, and I've actually been there about 4 times in the last year. This time I remembered my camera. 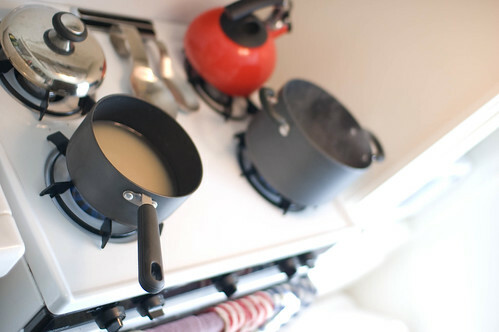 It's a straight forward bowl, with 2 choices of soup. The とんこつ pork broth is decent, but not even in the running against ばんから　or 凪, which are both nearby. The other choice is かつおだし. Katsuodashi is a simple broth used in all sorts of Japanese cooking. It could be said it is the chicken stock of Japan. Made from dried fish flakes, it has a subtle salty taste. 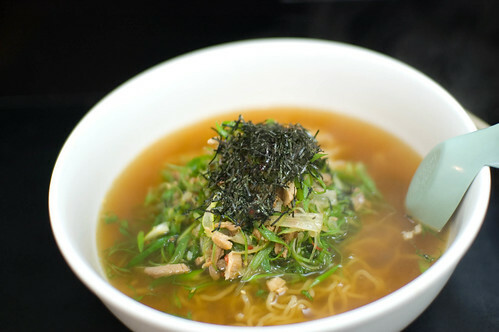 If you'v ever eaten anything in Japan, chances are it was flavored with this broth. A little fishy, the taste lingers longer than a soy sauce broth. Today, for some reason, it seemed to linger longer than usual, and I found myself popping mints 30 minutes later before my next student's lesson. To get there, go to Nakameguro station, exit and go down the alley on the left, along the tracks. It's about 30 seconds walk. Anyways, on to the cheese ramen. 1st question of course would be... it it delicious? I have good news and bad news for you there. Good or bad first? You want the good? Ah, an optimist I see. Well then, yes, it was delicious. 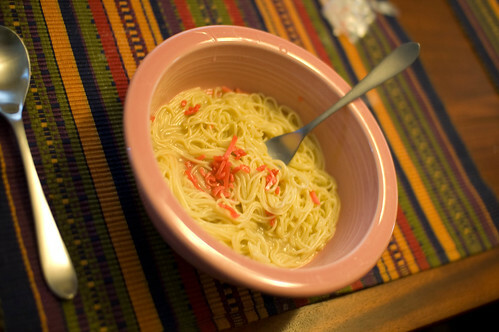 The つけめん noodles are served with a healthy pile of Parmesan cheese on top. That would just be a single, so on the side you get a bowl of what appeared to be Kraft cheddar cheese sauce. Now it's the W. Pour the cheese onto the noodles, and actually this would be suitable for a meal any day. You've pretty much created a ramen noodle version of Mac and Cheese (or Kraft Dinner for my Canadian friends). Being つけめん though, you are given a bowl of strong soup. Much too strong to drink straight, but perfect for dipping the noodles into. This shop specializes in a miso taste, with lots of vegetables and fish used to make the broth. Plenty of bits and pieces of pork, carrots, fishcakes, and menma complete the dish. Yes, it was as delicious as it sounds. Now the bad news. I was a little drunk when I ate here. Not the worst news, but ramen, covered in 2 kinds of cheese is definitely drunk people food. So my view may be different if I eat there sober. Which I probably will never do. You see, the Baird Nakameguro Taproom is right next to the station. If you like micro brew beer (地ビール, jibiru) then Baird is the best in Japan. Hands down. Oh, and on the topic of W, is it ironic that I got drunk off a micro brew called オバマIPA? That's Obama IPA. Lucky for me, Keizo has a ranking of 2008 LA ramen over at his site. I picked the closest one to where I was staying, Ramenya. Yep, it had a 20 minute wait out front. So far so good. From outside, everything looked pretty honest. Sat at the counter and asked for a recommendation... in Japanese. 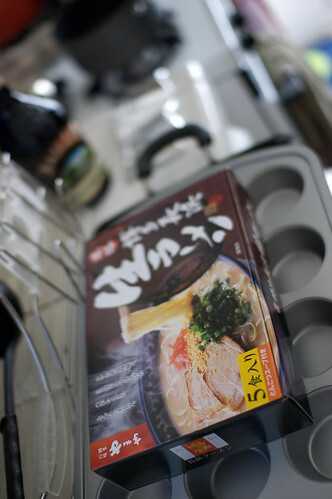 This is simple Japanese, おすすめ ？Osusumeh should get me the house specialty. Even if it's just a standard bowl, I always do it. Her reply was, "Just look at the pictures on the menu." To be honest, the おすすめ fails in Japan about 10% of the time too. But really, I know your place is popular and you can afford to be stand offish, but at least make something up. I chose a bowl of negi ramen. The pork was more of a shredded pork than traditional slices. It was also a little spicy, which was great. All in all a good bowl, worth a trip or 2 if you live in the area. 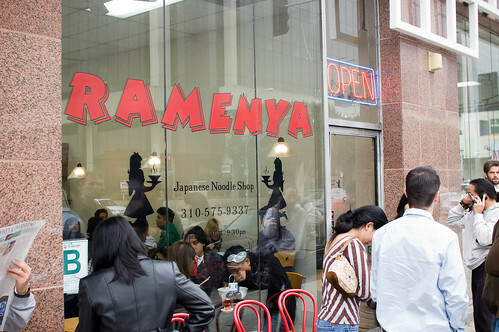 I like shoyu ramen, but if I found a good tonkotsu place I'd most likely never go to Ramenya again.